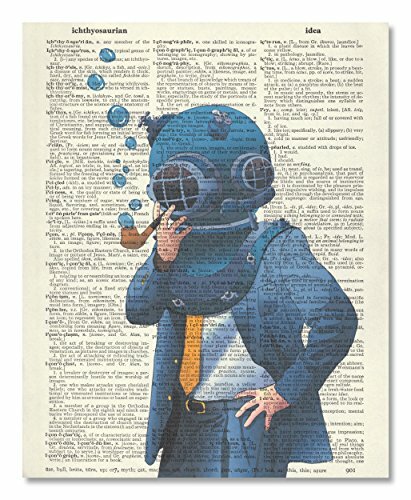 • This nautical-themed art print is designed by hand and is printed on vintage dictionary paper from the 1950s, 60s and 70s. The upcycled artwork breathes new life into old dictionaries, providing a unique backdrop for each piece of art. The aged dictionary paper has a warm tone, providing a storied backdrop that adds interest and character to any decor. • While the image you receive will be as pictured, each dictionary page is individually selected and carefully hand cut, making no two prints exactly alike. The pictured image is an original digital painting, created using a state-of-the-art digital painting tablet by our in-house artist. This results in an eye-catching, colorful and unique image which prints beautifully on the chosen paper. This art print is sure to spark conversation and lend a welcoming and creative touch to any room in your home or office. • Please note, FRAME IS NOT INCLUDED, however your print is cut to fit in standard 8x10 inch frames, as well as frames which have an inner matte cut to 8x10 inches. The print you receive is carefully packaged in both a plastic sleeve and cardboard envelope to protect it during shipping. Although images are created and printed using professional color calibration tools, colors on your print may vary slightly due to color variations from one dictionary page to the next, as well as differences in the color settings of your viewing screen. Nautical-themed upcycled art print on vintage dictionary paper. The design is an original digital painting, created using a state-of-the-art digital painting tablet by our in-house artist. FRAME IS NOT INCLUDED, you will receive just the print. Print comes in a clear plastic sleeve and cardboard mailer. Paper dimensions are 8x10 inches. Prints will fit in standard 8x10 inch frames or 8x10 inch mattes. If you have any questions about this product by Benchmark LLC, contact us by completing and submitting the form below. If you are looking for a specif part number, please include it with your message.